She gets her kicks at karate. Learn practical martial arts for empowerment and improved fitness. Parents, help your kids develop positive attitudes and cooperate with siblings. Encourage your kids to focus and work hard at their school studies. Teach your kids to avoid strangers and be safe. Karate training helps with all of the above. For Seniors 55+ White Crane Low-Impact Karate Class -Fridays 4:00 to 4:45 Santee Dojo. 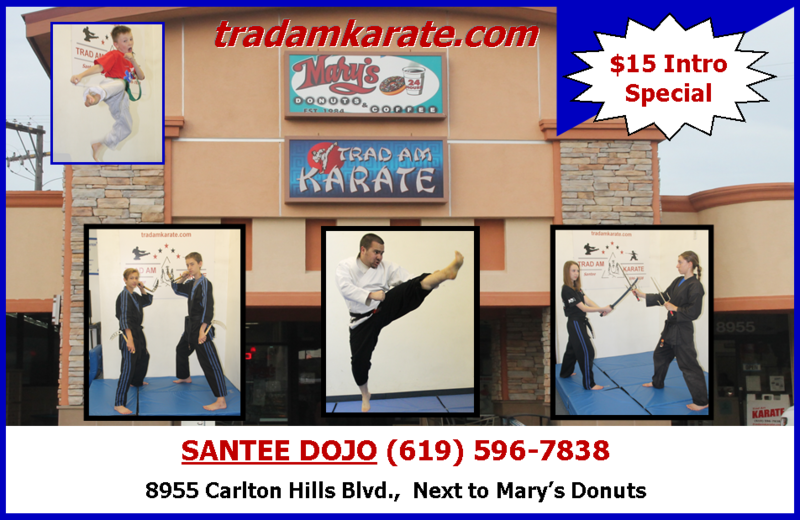 Welcome to Trad Am Karate in Santee California. We provide youth and adult martial arts training. You'll like our low fees which are month to month and there are no long term contracts to sign. We recommend that you read our information, come watch a class and get signed up. Participants can train individually, or as a parent and child duo or trio. In fact, an entire family can block, punch and kick their way to better physical and mental fitness, heightened focus and concentration and improved confidence and self-esteem. A favorite slogan here at Trad Am is, "the family that punches and kicks together, sticks together." Trad Am Karate teaches Traditional American Karate (TAK), an eclectic martial arts system that began in Southern California in 1982. TAK is based on shorin-ryu, shotokan and kung fu and incorporates techniques from judo, jujutsu, aikido, American Karate, kenpo and kickboxing. Weaponry, including kenjutsu, is also included in TAKs expansive martial arts catalog. To learn more, click "About TAK" on the tool bar, and then come on over to the dojo and get started. Remember, a thousand mile journey begins with the first step, and if you've gotten to this web-site, you are already moving forward. Thanks for visiting our web site and we appreciate your interest in Trad Am Karate. Tiger Cubs enjoy Friday night sparring with Sensei Ron V.
Self Defense, Self Defense in Santee California, Dojo, Karate, Karate-do, Kids Fun Karate, Martial Arts, Self-defense, Boxing, Kickboxing, Trad Am Karate, Traditional American Karate, Karate in Santee California, Martial Arts in Santee California, Self-defense in Santee California, Independent Karate Schools of America, IKSA, Floyd Burk, Martha Burk, Danny Chapman, Bernie Fritz, Bill "Superfoot" Wallace, Lisa Heitke, Kurt Oerum, Black Belt, Sempai, Sensei, Shihan, Renshi, Kyoshi, Hanshi, Master, Grandmaster, Sr. Grandmaster, Bo, Escrima, Kali, Nunchaku, Sai, Kama, Katana, Samurai, Samurai Sword, Karate-ka, Kobudo, Kenjutsu, Kata, Form.